The theme for polls this past summer and fall has been the 90's. 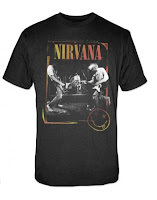 While most of these polls have focused on the trend the rose in popularity during that decade-Grunge, this post allows me to focus on one of the trends that faded during the 90's: Hair Metal. Within the Hair Metal scene, Warrant were already late-comers, with their debut album being released in January '89. By '93 the Hair bands were, by and large, struggling to maintain their platinum-selling status. With the recent passing of Jani Lane, the founding front-man of Hair-Metal legends Warrant, I took the time to reminisce on some of my favorite tracks in post # 156 on August 19th. Soon after, I posted the poll asking your opinion for favorite Warrant album. The resounding answer was Cherry Pie. 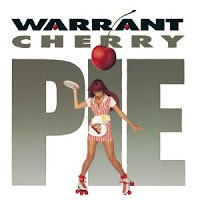 Cherry Pie, Warrant's second release, may have had perfect timing, hitting the charts in 1990. 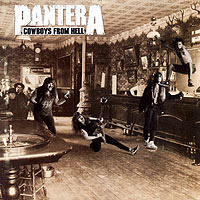 The album is still well known for its title-track, a song that has been typified as stereotypical, cliche Hair Metal. Lyrically the song is virtually 100% innuendo, but the heavy, pop-rock tune has a catchy chorus that is difficult to forget. If you take the time to look past this over-inflated, trade-mark title track, you will discover the true greatness of this album. The other singles it produced; 'I Saw Red', 'Uncle Tom's Cabin', and 'Blind Faith' each give more merit to this album's solid songwriting. 'Uncle Tom's Cabin' in particular shows the versatile side of Warrant. Beginning with an acoustic intro, adding a banjo to the melody, and changing tone a few times throughout as the guitars flip between electric and acoustic, this song gives you just about everything Warrant is capable of. However, what truly makes this song memorable is the narrative style of the lyrics. The song tells the story of a corrupt sheriff and deputy who dispose of a dead body in a swamp. The narrator, who observes the event along with 'Uncle Tom', portrays the weight of this circumstance quite well. Hello happy headbangers! It is time once again for the most anticipated reader's poll event of the year here at Heavy Metal 107: the annual INDEPENDENT BANDS READER'S POLL! This fall marks the 3rd annual running of this polling competition. Whichever band pulls in the most votes over a 35-45 day window will get a full review posted on the blog shortly after the poll closes, a link to their main website on the blog's side-bar for 1 year as 'Honorary Vice President', and brief promo posts announcing any upcoming shows they schedule during that year. 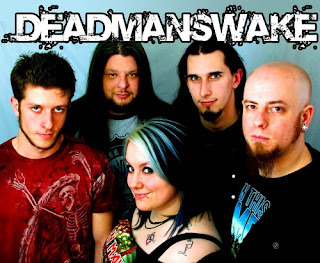 Nominated by last year's winner, Deadmanswake, Sins Of A Nation blend thrash and classic British-style metal in such a way that one can't help but bang their head to it. Their vocalist has an uncanny ability to channel the likes of Bruce Dickinson, Ozzy, and Phil Anselmo, depending on what the song calls for. You gotta hear these guys! Please vote for your favorite band in the monthly reader's poll! 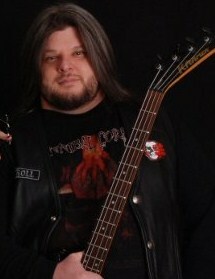 Selecting the bands that are included in the Heavy Metal Madness 2012 tournament was not as simple as you might think. For this daunting task I actually enlisted a selection committee of my close friends with a broad appreciation of hard rock and heavy metal music to assist me. All of their input has helped make this contest a more accurate representation of the state of heavy metal music today. Although 68 bands seems like a lot, there were many many more that many of us considered that didn't make the cut. In no particular order, the bands that are not on the final bracket, but deserve an honorable mention: Iced Earth, Skid Row, Lamb of God, Gwar, Machine Head, Ratt, Immortal, Amorphis, Venom, Poison, Behemoth, Mastadon, Overkill, Pink Floyd, Emperor, Staind, Municipal Waste, Beatles, Dimmu Borgir, Offspring, Metal Church, Heathen, Blind Guardian, The Rolling Stones, The Doors, Nile, Mudvayne, Decapitated, Mushroomhead, Therion, In Flames, Otep, Primus, Rancid, Holy Terror, Artillery, Dokken, Journey, Kalmah, Bloodbath, Cannibal Corpse, At the Gates, Shinedown, My Chemical Romance, Nevermore, Sodom, Sacred Reich, Yngwie Malmsteen, Tesla, Morbid Angel, Necrophagist, Suffocation, Cradle of Filth, Bathory, Enslaved, Alkaline Trio, Rammstein, Warrant. My thanks again to the Heavy Metal Madness Selection Committee: Rocky the Rockette, Franthrax, foxymophandlematt, Jeremy, Wolf, and Stygian. Good luck on filling out your brackets everyone! It's finally here! The OFFICIAL Bracket for Heavy Metal Madness 2012! 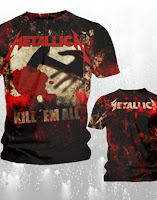 This contest will play out over the course of 2012 through numerous reader's polls each month here at Heavy Metal 107. The winner in each match-up will be determined ENTIRELY BY YOUR VOTES! The only exception will be in the event of a tie, in which case the higher seed will advance. So keep an eye on this blog on a monthly basis so you don't miss a chance to vote for your favorite bands! Spread the news to your friends by sharing this blog on your social networks, the more votes the better. There will also be a contest, with prizes, for the most accurately predicted brackets. THERE IS NO ENTRY FEE! All you need to do is completely fill out the bracket with the bands you think will advance in each round, and send it back to me by the deadlines below and you're in! Scoring: For each correctly predicted match-up, each entry will earn points based on the band's original seed multiplied by the number of the round*. The first round of 64 bands begins in January, runs through May, and will be played out in four 30-35 day polling windows. The second round of 32 bands will be conducted over two 30-35 day polling windows in June and July. The Sweet Sixteen is the 3rd round, Elite Eight is 4th, and the Final Four is the 5th AND FINAL round. *The only exception to the seed-based scoring is in the 'play-in' round (where the 16th and 17th seeds face-off for the chance to face the #1 seed in each quadrant). A correct prediction of this round will count as 1 point, and will only be used to decide a tie-breaker among entries at the conclusion of Heavy Metal Madness. The play-in round is considered a 'bonus round', and is not required to be eligible for this contest. The play-in bonus round does have an earlier deadline than the official deadline to submit a bracket prediction. In each poll, in the event of a tie, the higher-seeded band will advance, up until the Final Four. If there is a tie for 1st place in the Final Four, there will be a tie-breaking follow-up poll featuring only the 2 bands that tied for first. Only the correct winner is needed to earn points for any given round. There is a bonus of 5 points for each correct band to reach the Final Four, and a bonus of 10 points for correctly predicting the overall champion. Prizes will be given away to at least the 5 highest-scoring brackets, possibly more depending on the number of entries received by the Heavy Metal Madness deadline. Prizes will consist of a variety of the following items: CDs, DVDs, magazines, posters, or stickers featuring bands from the Heavy Metal Madness bracket. I will ship them to the winners at my own expense. You may also request my mailing address through that email, and I will accept paper-copies of your predictions so long as the envelope is post-marked by the deadlines given above. Feel free to contact me if you have any questions or are unclear about any specifics in this competition. It can also be found at the bottom of the blog, where it will be updated once the tournament has begun. 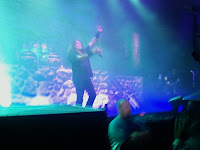 The American Carnage Tour (2010), Part II: Testament, Megadeth, & Slayer! Picking up where I left off from part I of this review (post #146), my new friends and I left the VIP suite as Megadeth bid us farewell as they went backstage to prepare for the show. We were granted early entry to the floor-level and vendors. 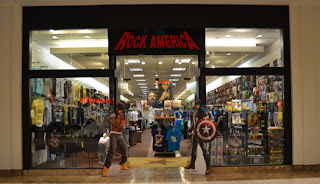 I made a short detour to get a souvenir tour T-shirt (I chose the Megadeth: RUST IN PEACE 20th Anniversary Tour shirt). Then I entered the arena floor and got right up close to the front barricade. There was one row of people in front of me, and I had a great view of the stage. This was sure to be an awesome show! Time seemed to drag for a while. I conversed here and there with other fans, and watched the crowd slowly fill in the standing-room-only floor level. 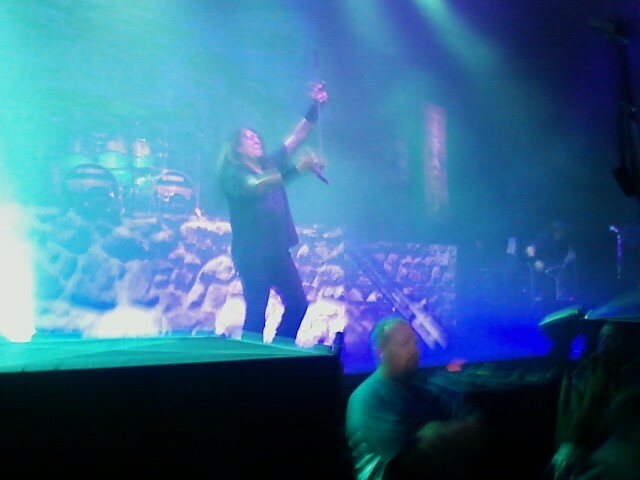 But finally the wait paid off: Testament took the stage to deliver their set of killer thrash-metal! When it comes to thrash metal, everyone probably think of the Big Four first, particularly in the last couple years when they have been performing select shows together for the first time. However if there was a 5th thrash band on the totem-pole when it comes to significance in the genre, it is probably Testament. Their energy, bone-crushing heavy riffs, and seriously fast-paced tempos served to prove that they were right at home with two of the Big Four whom they were opening for. They opened their set with the intro from their latest album The Formation of Damnation. This album was a true return to form for Testament, and they are helping bring traditional thrash back to prominence in today's metal scene. Inevitably, with the break-neck pace of their music came the break-neck intensity of the mosh-pit. It had erupted about 3 or 4 rows of people behind me, and the people who opted out of moshing crammed more closely together. The physical pressure of being packed so tightly together and close to the front barricade built to an uncomfortable level many times, but I'd be damned if I was going to give up this close spot before I had my chance to see Megadeth this close. So I toughed it out, and managed to hold my own through their set. 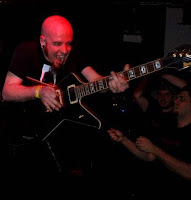 My adrenal glands got the best of me, and I was helpless to sing along to one of my all-time favorite thrashers, 'BROTHER WILL KILL BROTHER! SPILLING BLOOD ACROSS THE LAND! KILLING FOR RELIGION, SOMETHING I DON'T UNDERSTAND!' I think I sang along for the entire first song. 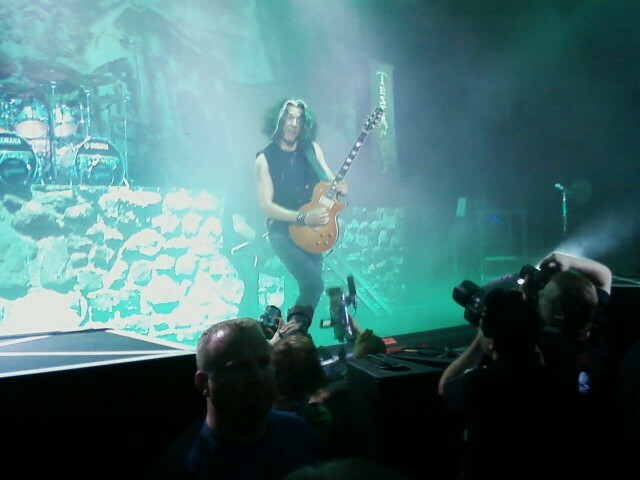 I could see Dave up at the mike, and I could hear the crowd behind my own voice, also singing along. 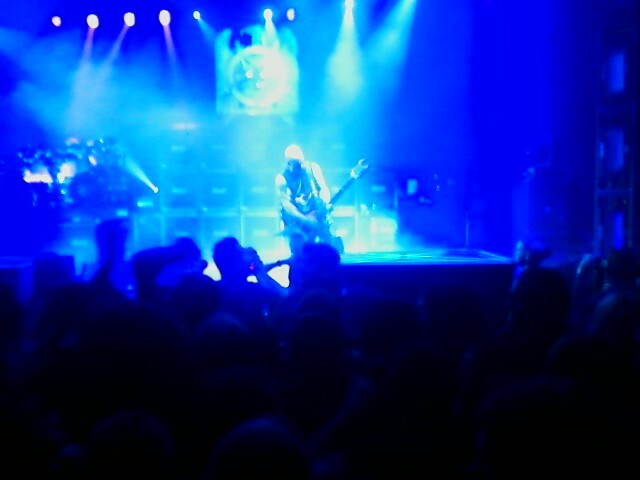 For all I could hear, Mustaine could have been lip-syncing. I could see his jaw moving, but his mop of blond hair kept his face partially obscured. 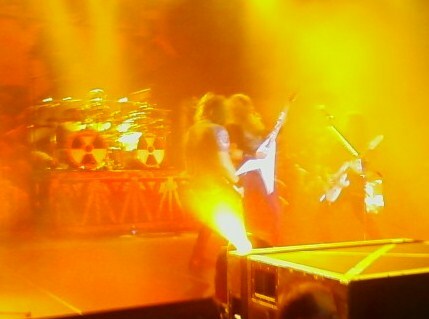 Dave Ellefson and Chris Broderick were thrashing along, keeping perfect time... the band seemed so tight! The fast-paced, complex riffs that overflow the Rust In Peace album seemed second-nature to Megadeth. This was a technical masterpiece of heavy metal being brought to life for the lucky fans that attended this tour. At some point I cut back on the singing-along, perhaps because my throat was getting dry. This was in early August, remember, and the mass of bodies was making the heat more and more apparent. When they got to 'Poison Was The Cure', the band went back-stage to swap instruments, while Ellefson kept us entertained with the song's bass-intro. Shawn Drove returned to the drum-kit and added the next ingredient, closely followed by Dave and Chris on guitar. 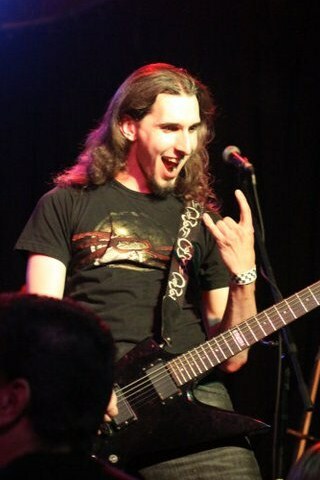 Then, right on cue with the song, the intensity was back, and the crowd resumed undulating with headbanging and moshing! Megadeth continued to fly through this masterpiece album! 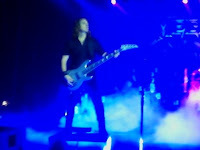 Some other highlights of the performance for me were Dave Ellefson's bass spotlight during the track 'Dawn Patrol'. During that number, David Ellefson was alone on-stage, while Dave Mustaine spoke the dialog/lyrics from back-stage somewhere. 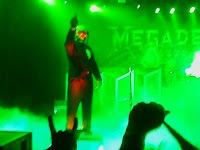 Also, this was the part of the show where Vic Rattlehead walked onto the stage and pointed intimidatingly at us. After this number concluded it was on to 'Rust In Peace... Polaris', the last track on the Rust In Peace album. Megadeth still had more for us, and they played about 5 more numbers from the rest of their catalog. They saved 'Peace Sells' for their closing number, but it came with a nice twist this time... As the song was about to end, they surprised us by jumping back to the guitar solo from 'Holy Wars...'! 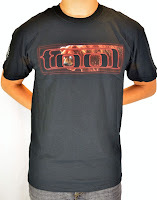 The band jammed a few more minutes on that number, during which Dave Mustaine introduced the band, traded several solos with Chris Broderick, and then wrapped it up as 'Holy Wars...' ended: "Next thing you know, they'll take my thoughts away!" I couldn't imagine a better way to see Megadeth for the first time, except maybe for a longer set! During this intermission, I finally chose to give up my front-row location to seek out the water fountains- I was pretty dehydrated! I found them, and waited through the line to get replenished, then returned to the arena floor. By this time I think I had lost track of some of my new friends, but before the show resumed I did bump into one of them again. 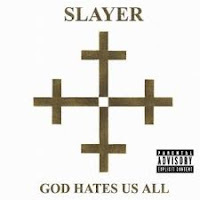 But now, it was time for SLAYER! In slightly different fashion, Slayer kick off their set with 2 tracks back-to-back, from their newest album: 'World Painted Blood', and 'Hate Worldwide'. Then, the anticipated 20th anniversary celebration of their classic album Seasons In The Abyss began as Tom Araya shouted, "WAR ENSEMBLE!" Seasons In The Abyss (which I reviewed earlier this year already) starts off with 3 tracks that, on the recording, pick up after each other with barely a pause between the tracks. To the best of my recollection, Slayer played them live in a similar fashion: 'War Ensemble', 'Blood Red', and 'Spirit In Black'. They continued through their classic album, with true-to-the-recording accuracy, much like Megadeth had done before them. Again, they added a few of their best known songs after the Seasons In The Abyss performance was over. To me this was a legendary night of thrash-metal icons performing at their best! From the golden opportunity of meeting the members of Megadeth, and hanging with the before the show, to the KILLER performances of all three bands, to the new friends I made on this day, I'm tempted to say this was the best concert of my life! I hope to catch each of these bands again at points in the future. For now, I'll leave you with their set-lists so you can listen for yourself to at lease some form of this night's great metal music! 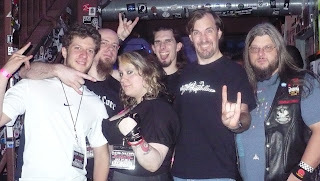 Eliminator are an independent metal band out of New Jersey. When I first heard about them through another heavy metal music blog I follow, I thought, 'OK, here's another one out of countless black/death metal bands. What could it hurt to check 'em out?' In this case, I was glad I did. I downloaded their debut album Breaking the Wheel, and gave it an honest listen. The first thing that impressed me about the sound on this album was how they seem to hearken back to the early days of thrash and speed metal, rather than just grinding out riffs. I found enough intricacies in their guitar work to hold my interest. For now, I am going to focus on Breaking the Wheel. This album bludgeoned my skull in ways it hasn't been abused since the days of early-era Sepultura. The guitar tones truly capture that early thrash-era tone. The drums fill a wall-o-sound with decadent blast-beats that challenge the upper limits of tempo. Warchild's vocals are demonic screams and shrieks, though he sometimes will drop into deeper tones that remind me of classic Slayer vocals. 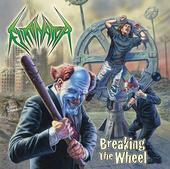 To check out this album, and more of Eliminator's music visit their myspace page! Iced Earth released their debut album in 1990, and quietly built a strong underground following throughout the decade. By 1998, they had become one of the biggest names in American power metal. 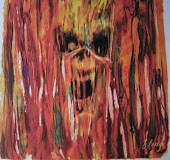 Something Wicked This Way Comes, their 5th album, saw the band touring more extensively than ever. 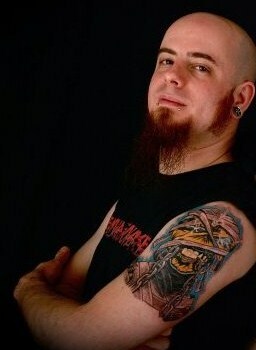 The strength of fan support for this album also led to the recording of Iced Earth's first live album, Alive in Athens. Your votes last month for your favorite Iced Earth album of the 90's further confirms the significance of this release. 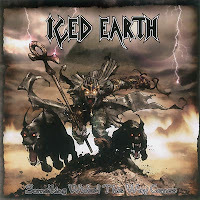 Something Wicked This Way Comes displays Iced Earth at one of the high-points of their career. 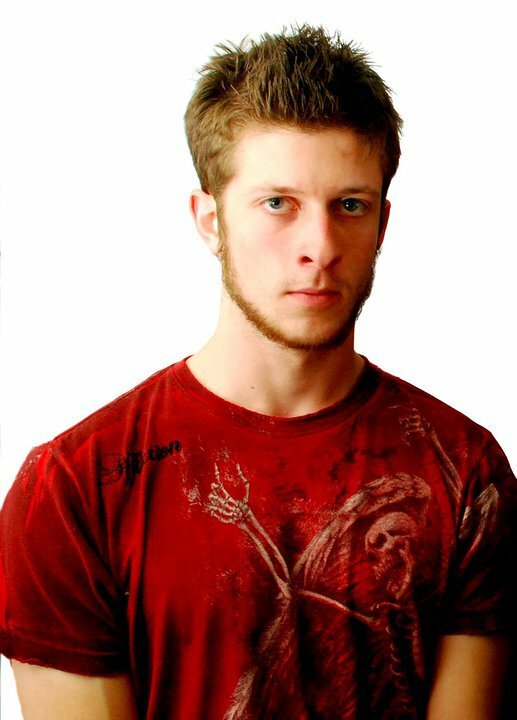 Having established Matt Barlow as the band's main-stay lead singer, the band's stability was also at a peak. This album has several tracks that are now Iced Earth classics, as evidenced by their inclusion in both the Alive in Athens live album and their 2-disc compilation The Blessed and The Damned. Something Wicked This Way Comes is a well balanced thrash/power metal album, incorporating a variety of melodic guitar parts with Iced Earth's traditional speed-metal riffs. Matt Barlow's vocals are as strong as ever, as he displays his vocal range with mastery throughout this album. 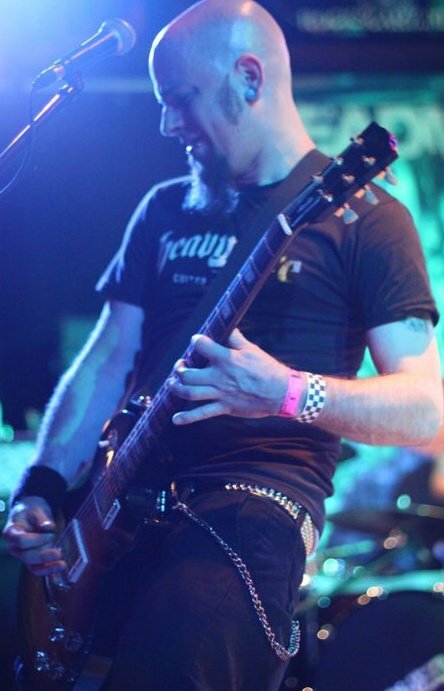 Jon Schaffer's songwriting and guitar playing are also above the standard the band had shown by this stage of their career. All in all, this is perhaps the best album Iced Earth have recorded. 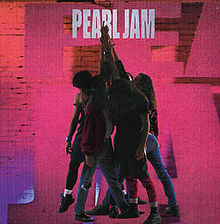 It certainly got your vote for the best album from this band in the 90's! DEADMANSWAKE makes Elbo Room debut on Sept. 27th! Today I'm writing to remind you that DEADMANSWAKE will be playing at Elbo Room in Chicago, IL on Tuesday, September 27th for the very first time! 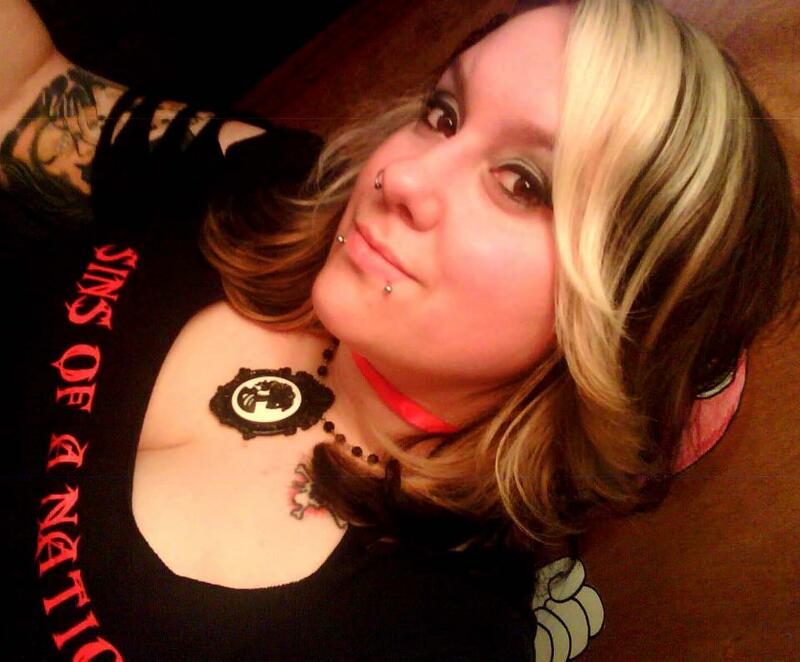 They're appearing as part of the "Project Independent Tour" along with Sins Of A Nation and several others. If you have no other plans for this particular Tuesday evening, why not come down and catch some great, live, Heavy Metal music? Visit the Elbo Room for more details! Two days ago, we observed the 10th anniversary of the Al-Queda attacks against the World Trade Center, and the Pentagon. Though this horrific event is doomed to live in the memories of everyone who lived and breathed on that infamous day, it is still a reminder that the values that unify the United States will always win out over anything that tries to divide us. 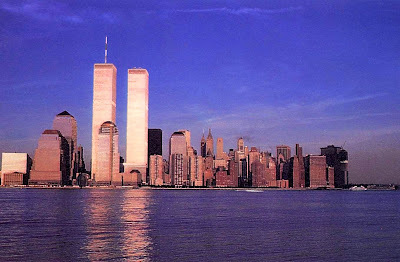 With this post I will share some songs that live in MY memory, forever connected with September 11th, and many songs directly inspired by the events of that day. 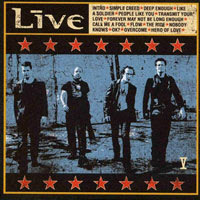 From their 5th album, released one week after the attacks. One of Chicago's radio stations began playing this song, with audio clips from news casts of the attacks mixed in. It became a song that many clung to as they tried to comprehend this tragedy. All these songs are inseparable from the event in my mind, however the one song that first imprinted itself in my mind about September 11th, and has the most lasting impression of how we all felt in the days, weeks, and months afterward, is "My City of Ruin" by Bruce Springsteen. 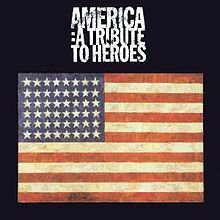 Though he had written the song before 9-11, he had tweaked a few of the lyrics by the time he performed it on September 21st as part of the 'America: A Tribute to Heroes' telethon. These are just the songs I thought of off the top of my head. Feel free to share your personal songs about 9-11 in comments below. For those of you who've been following this blog for a while, you may have noticed that I usually use the phrase 'favorite' in all my reader's polls as opposed to 'best'. This is mostly because saying a thing is your 'favorite' is easier. 'Favorites' can be based on one individual's opinion, and requires no further justification. To say something is the 'best' requires more justification and explanation. Sure, I can easily say whatever I think is the best, but that may differ greatly from what the next guy would say is the best. On this blog I try to let the reader decide for their self what is best. 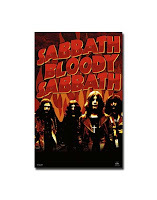 Well, coming up in 2012, I might make one exception to this rule of thumb I've been following, and try to decide who is actually the 'Best*' heavy metal band. The '*' would reference the following footnote: 'based on reader opinion'. How does that sound to you, dear readers? It will be called HEAVY METAL MADNESS, and be designed after the NCAA's March Madness basketball tournament. Spanning several months (possibly the entire year), I will post numerous reader's polls each month. Each poll representing one match-up in the giant bracket. 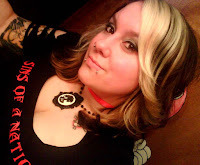 The bands I choose to include will represent the most influential bands I can think of from the most relevant genres and sub-genres in hard-rock and heavy metal music, from the early 70's up 'til now. The reviews of each poll-winner will be much briefer since there will be several results each month, but essentially a summary of who advanced and who was knocked-out should suffice. Hopefully this tournament-style reader-opinion poll will keep your interest peaked, as each month you invest more and more of your own fanaticism into HEAVY METAL MADNESS. I've found that when the NCAA tournament comes around, I'm always more interested in the results in years when I participate in an office pool or two. Hopefully this can have the same effect with Heavy Metal music. Would you agree? We'll begin to find out in 2012! I plan to initiate this tournament very soon after this fall's annual Independent Band Of The Year poll (formerly called the 'Myspace bands poll'). If all goes well, it will prove to be the ultimate contest for the BEST* Hard-Rock/Heavy Metal band ever! Blog Update: Check out new features! I want to take a minute to point out a few changes I've made to the blog recently. Most obvious is the relatively new banner at the top of this page. I've mentioned it earlier, shortly after I uploaded it. Again, thank you to Andy at Traynart Graphic design for that. Next, I want to point out the box on the left hand column where you can now enter an email address for a quick and easy way to follow this blog. If you've enjoyed any of my posts, please take a second to enter your email, so you won't miss a single post! Other changes I've made include the re-organizing of the links section. I've now split it into 3 sections. First are the links to off-shoots of this blog that I've created myself. These are called 'Happy Headbanger links', and include my Pandora radio station, a Facebook page, and Twitter feed. The second category 'Music, Rock, and Metal Blogs' includes the other music oriented blogs that I follow. The 3rd category, 'Other Blogs' contains the blogs I follow that don't necessarily relate to music or heavy metal in any way, but I still recommend them! In my blog settings, I have now made comments open to all! This feature used to be restricted to google account holders, but not anymore. You should now be able to comment on any post, remaining anonymous if you choose. Lastly, the "Coming Soon" section will slowly be phased out. I still want to write about these topics, so I will leave the list there until I get to each item on it. However, since I have a bad habit of adding items to this list faster than I get around to writing them, I'll simply stop adding topics to it. The "Honorary Vice President" spot was created for the winner of last year's 'Independent Bands Reader's Poll'- DEADMANSWAKE. Unlike the 'President' spot, which lasts for a term of 2 years, the VP spot will last for 1 year (until the next 'Independent Bands Reader's Poll'). Watch for the new 'Independent Bands Poll' coming in October!